After the conquest of Sind in 1259/1843, the British attempted to subjugate neighbouring Baluchistan, in which the Aga Khan again helped them militarily and diplomatically. From Jerruk, where the Aga Khan was staying after February, 1843, he contacted the various Baluchi chieftains, advising them to submit to the British rule. He also sent his brother Muhammad Bakir Khan together with a number of his horsemen to help the British against Mir Sher Khan, the Baluchi amir. Soon afterwards, the Aga Khan I was given a post in Jerruk to secure the communications between Karachi and Hyderabad. Charles Napier writes in his diary on February 29, 1843 that, "I have sent the Persian Prince Agha Khan to Jherruk, on the right bank of the Indus. His influence is great, and he will with his own followers secure our communication with Karachi. He is the lineal chief of Ismailians, who still exist as a sect and are spread all over the interior of Asia." H.T. Lambrick writes in "Sir Charles Napier and Sind" (London, 1952, p. 157) that, "Bands of Baluchis had plundered most of the wood and coal stations on the Indus, interrupted the mail route to Bombay via Cutch, and also the direct road to Karachi, whence supplies and artillery had been ordered up. With a view to reopening communications with Karachi, Sir Charles sent the Agha Khan to take post at Jherruk with his followers, some 130 horsemen." On March 23, 1843, the Aga Khan and his horsemen were attacked by the Jam and Jokia Baluchis, who killed some 70 to 72 of his followers, and plundered 23 lacs of rupees worth of the Aga Khan's property. Napier, in April and May, 1843, sent warnings to the Jam and Jokia Baluchis, asking to return the plunder of the Aga Khan and surrender. In May, 1843, Napier ordered his commander at Karachi to attack and recover the property of the Aga Khan, which was done. The encounter of Jerruk had been equated by the Aga Khan I, according to the native informations, with that of the event of Karbala. In Jerruk, some 70 to 72 Ismaili fidais had sacrificed their lives in fighting with the enemies of their Imam, and their dead bodies were buried on that spot. According to the report of "Sind Observer" (Karachi, April 3, 1949), "Seventy dead bodies of Khojas buried 107 years ago at Imam Bara in Jherruck town, 94 miles by road north-east of Karachi, were found to be fresh on being exhumed recently in the course of digging the foundation for a new mosque for the locality, a Sind government official disclosed on Saturday. The bodies which lay in a common grave were again interred another site selected for the mosque. The Khojas were believed to have been murdered in a local feud 107 years ago according to local tradition in Jherruck." It was with the approval of the British government that in 1260/1844, the Aga Khan sent Muhammad Bakir Khan to capture the fortress of Bampur in Iranian Baluchistan. Later, he also sent his other brother, Sardar Abul Hasan Khan, who finally occupied Bampur and won other successes in Baluchistan, while Muhammad Bakir had been relieved to join the Aga Khan in India. The Aga Khan built his residence at Jerruk, resembling the style that of the Mahallat. Jerruk, a town about 89 miles and 2 furlongs from Karachi via Gharo, Thatta and Soonda; is 150 feet high from the Indus level, having two hills blanketing the town from two sides. About 300 to 350 Ismailis lived in Jerruk, and the Aga Khan I made it his headquarters. Meanwhile, the Aga Khan quitted Jerruk, and proceeded to Kutchh via the port of Karachi on Ramdan, 1260/October, 1844, which was his first marine trip. Maharao Shri Deshalji, the ruler of Kutchh feted him with due consideration at Kutchh Mandvi, and took him to Bhuj and gave him a state bungalow for his stay. 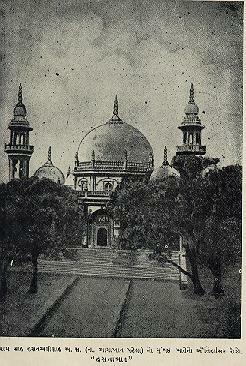 The Aga Khan then moved to Kathiawar, where Jam Saheb Shri Ranmalji received him in Jamnagar. For a year, thereafter, he travelled through Kathiawar and came to Bombay via Surat and Daman on December 16, 1845 and was well received with the cordial homage of the whole Ismaili population of the city and its neighbourhood.